Co Down fisherman Edward Nicholson and his wife Shirley chose Beltex as their preferred terminal sire in 2000 and would not consider any other ram now. Crossbred ewes with their Beltex sired lambs grazing in Co Down. 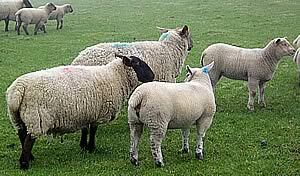 They are delighted with Beltex for ease of lambing and top grading performance which is ideal for his farming policy. So impressed were they with their first ram that they now have established the Derryouge pedigree flock of their own. Edward is a fisherman sailing from Kilkeel on a regular basis and is no stranger to harsh conditions and stringent regulatory constraints within his work leaving Shirley to care for the flock. He was first drawn to Beltex to increase his average slaughter grades and improve the quality of the lamb carcass by providing a leaner lamb with a much higher meat to bone ratio. He bought his first Beltex ram from S & P Clarke's Creevy flock and saw an immediate improvement in grades in his lamb crop. To date these lambs have had exceptional growth rates and well above average kill outs. At eleven weeks of age they have reached 24 Kg deadweight and kill out as high as 60%. When selecting lambs for slaughter anything at 39 Kg live will produce at least a 21 kg deadweight He has proven that year after year the Beltex will give consistent lamb crops with amazing genetic stamping. The lambs are sought by the processor who knows that they will produce more lean meat per lamb due to a combination of fine bone structure and superior grading. Selling his lambs through Peirce Connolly and Doherty and Grey he is assured that he can collect the bonus payments for the top grades and get paid for weights up 23 Kg. This brings a benefit of at least £4.80 per head. With the early lamb crop ready for market he is now turning his attention to the lambing of the pedigree flock and the remainder of his commercial lambs which will be born from mid March onward. He would normally have these later commercial lambs sold by July and the pedigree will either be sold direct or through the Pedigree sales from September on.